Expected to air on 3rd July 2015, Classroom☆Crisis (クラスルーム☆クライシス) is a slice of life original anime with an extraordinary story. The lead characters are two high school students and their young teacher, all living in Fourth Tokyo, Japan, Mars. Interested? We find ourselves in the future where people have managed to colonise the entire Solar System. We are flying to Fourth Tokyo on Mars to meet a set of extraordinary talents. Classroom☆Crisis evolves in an educational facility, located in an economic zone governed by the Kirika Corporation (Kiri-ka Kouporeeshon) and famous as the best place to do aerospace business. As part of the local school, Kirika has created a special talent development education program known as A-TEC. This way, the corporation scouts for children with special abilities and prepares them for space missions and innovative aircraft research – whichever suits their talents best. One day, a transfer student is kidnapped and the members of A-TEC have to embark on their most dangerous mission so far. Kaito Sera (Showtaro Morikubo) is the Director of the Education Development Program (a.k.a. A-TEC) and a homeroom teacher. He is an expert in rocket science and dreams to create an innovative space engine. Because of his young age, he is very popular amongst the students. Iris Shirasaki (Sora Amamiya) is a third grader in the Kirika School and part of A-TEC. She is a test pilot with top manoeuvring skills but, ironically, a very reckless driver when it comes to trivial rides, like bikes for example. Mizuki Sera (Ari Ozawa) is another third grader and also an engine maintenance mechanic at A-TEC, assigned to pilot Iris. Mizuki has lost her parents recently but remains close to her brother Kaito with whom they share a home. Besides everything, Mizuki is also part of the class committee and a fashionista. The Classroom☆Crisis anime characters when at school. Subaru Yamaki (Yoshino Nanjou) is a first year student and the person responsible for the main engine and auxiliary booster, as well as the success of the combustion test. He is bursting with confidence and won’t part with his white lab coat, even when wearing his school uniform. Famous for his somewhat androgynous looks, he is sometimes mistaken for a girl. Tsubasa Hanaoka (Aya Suzaki) is a very energetic sophomore with great intellect. She is handling the PR communications for A-TEC and, even though she seems to joke around about him, has great respect for Program Director Kaito Sera. Makoto Ryouke (Minami Tsuda) is a third grader and is also handling all logistic-related matters when it comes to aircraft building materials. Often being the funny one in the team, she is capable to keep her cool, when the situation gets critical. Kaoruko Takanashi is only a first year student, hence the youngest girl in A-TEC. She has a shy and quiet personality, is loved by everyone and even considered as a ‘lucky charm’ for the team. Responsible for the communications during test flights, she is often considered to be Makoto Ryouke’s assistant. Yuna Nounen is a sophomore and an accountant for A-TEC. She is striving to tighten the budget of the organisation, but has to constantly comply with approving huge expenses. Aki Kaminagaya (Shiina Natsukawa) is a sophomore and also responsible for the engine maintenance. Often assisting Kaito and Mizuki, she has a ‘mekafechi’ a.k.a. mecha fetish. Classroom☆Crisis’ characters in casual ware! Kojiro Kitahara (Toshiyuki Toyonaga) is a third grader, like Iris and Mizuki, and is in charge of the aircraft design for A-TEC. He is much more mature than his classmates, but still loves to have fun when out with the boys. Sakugo Maioka (Takayuki Kondou) is a sophomore, an ultimate geek and an IT Executive for A-TEC. Being such, his skills for information processing and hacking are exquisite. He is also the person one can count on for putting things back on track. 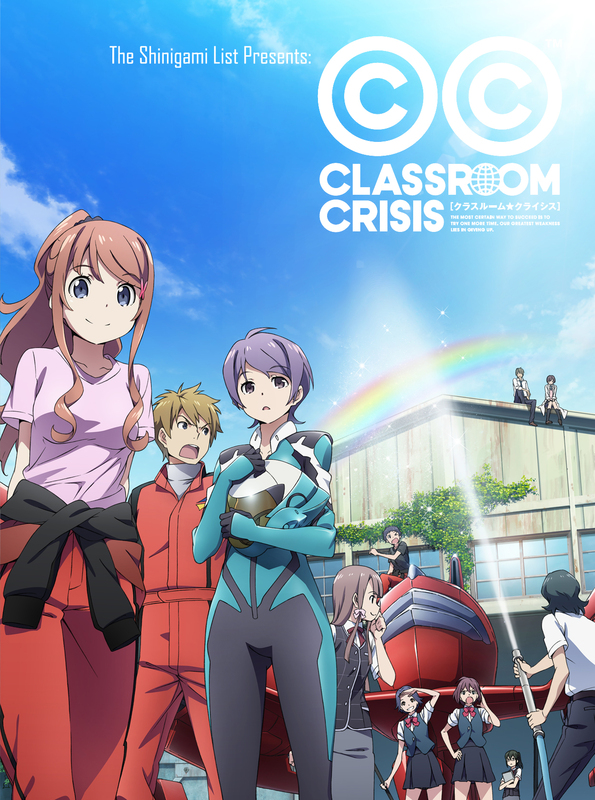 Classroom☆Crisis is just one of the 2015 summer anime season. Check out more in the Guide. That looks very pretty. Thank you!